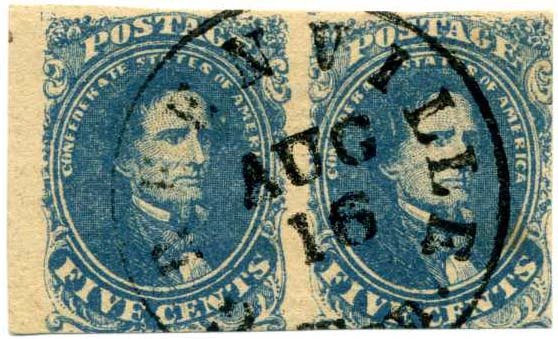 CSA 4, 5¢ blue horizontal pair neatly tied by well struck bold blue PETERSBURG / VA. cds on piece, small tear in left stamp, handsome pair, SCV $490. 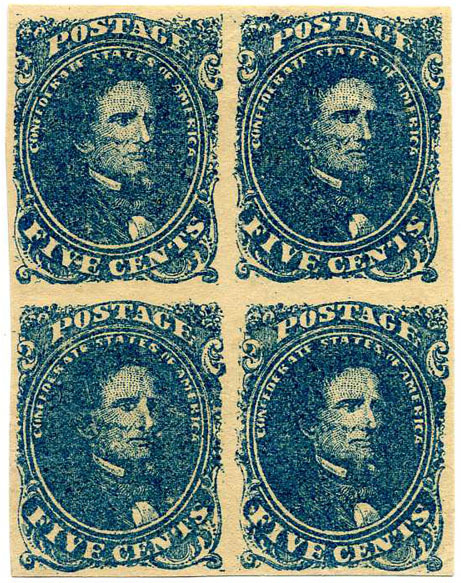 CSA 4a, 5¢ dark blue block of four, lower left stamp is a "Pop Eye" variety and there is a break in the outer oval above the "S" - could no doubt easily be plated. 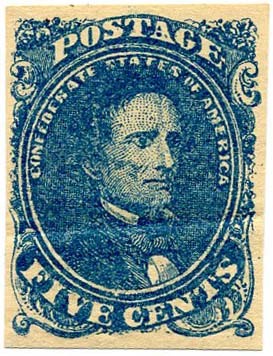 Light diagonal crease at upper left, gum soaks and full original gum. Scarce multiple. SCV $1,300 for Stone 2 and $4,500 for Stone 3. You do the plating, you reap the reward. 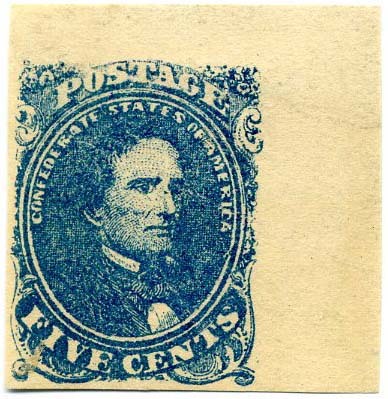 CSA 4, 5¢ blue, unused, no gum, corner crease at lower left, Very Fine appearance, while most likely a Stone 3, this cannot be determined without plating. SCV for Stone 3 is $750, Stone 2 SCV $225. CSA 4b, 5¢ milky blue, tied on small piece with blue (DU)BLIN / VA cds, SCV $220. 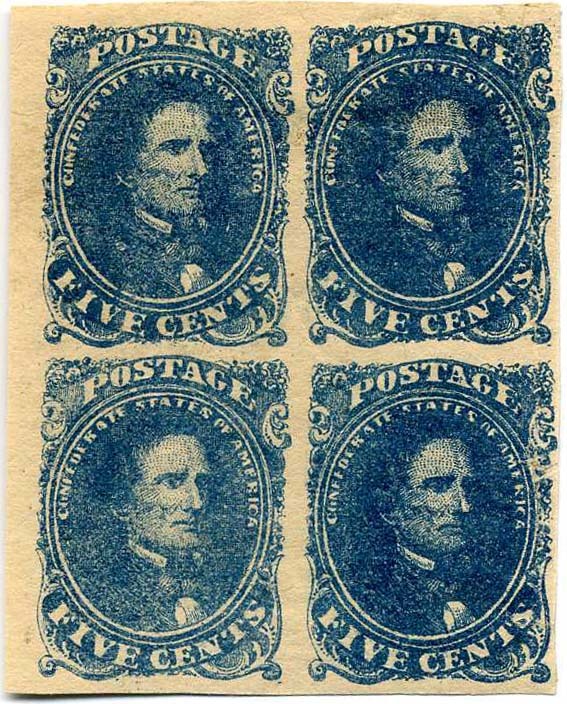 CSA 4, 4¢ blue bottom sheet margin block of four, full original gum, top stamps never hinged, Very Scarce in multiples. 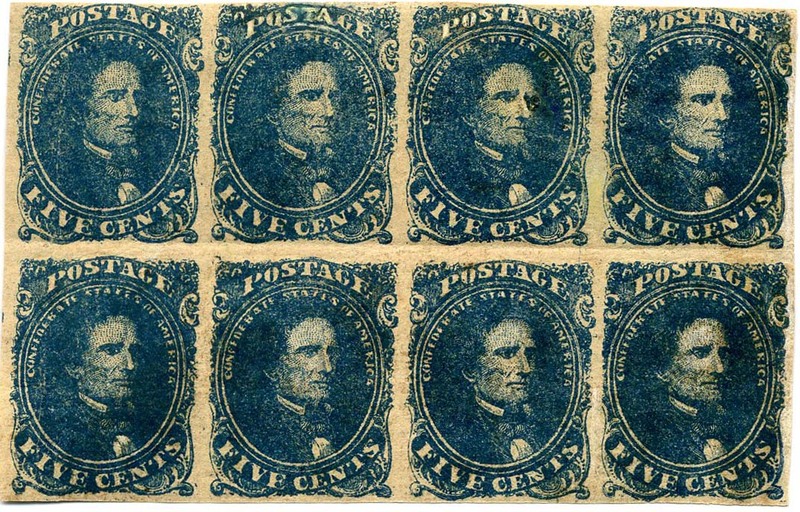 CSA 4a, 5¢ dark blue, probably Stone 3 but has not been plated so no guarantee to that (should not go by color and clarity alone), unused with full original gum, hinge remnant, nice 4-margin copy, Stone 3 cats $800 vs. $225 for Stone 2, either way a beautiful stamp. 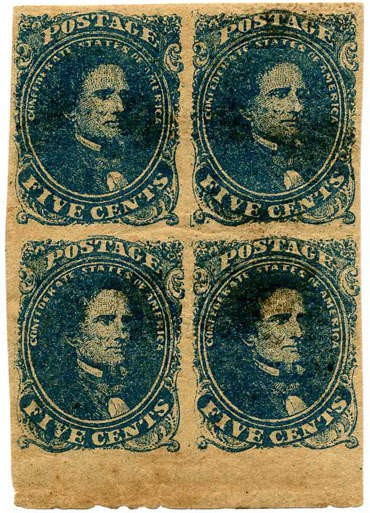 CSA 4, 5¢ blue tied on small piece by ---VILLE partial town cancel, small scuff at upper right. 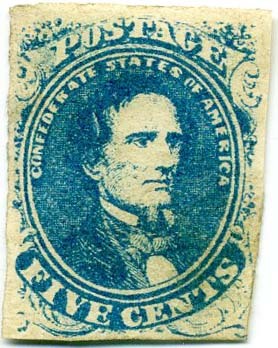 CSA 4, 5¢ light blue, used with Richmond cds, thinned but Most Attractive. 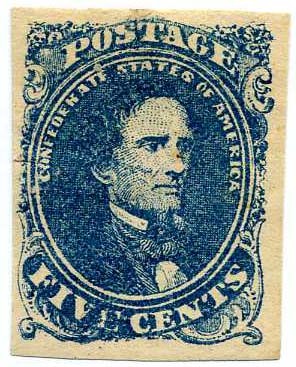 CSA 4a, 5¢ dark blue left sheet margin copy with large part of stamp at bottom, overlapping town cancels, vertical crease, rich color. 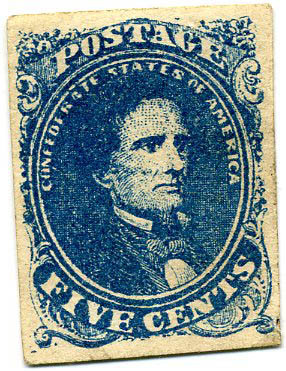 CSA 4b, 5¢ milky blue used with neat partial town cancel. 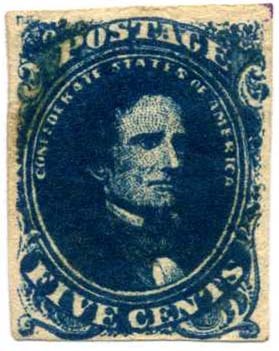 CSA 4, 5¢ blue, original gum, never hinged, light horizontal crease, SCV $225. 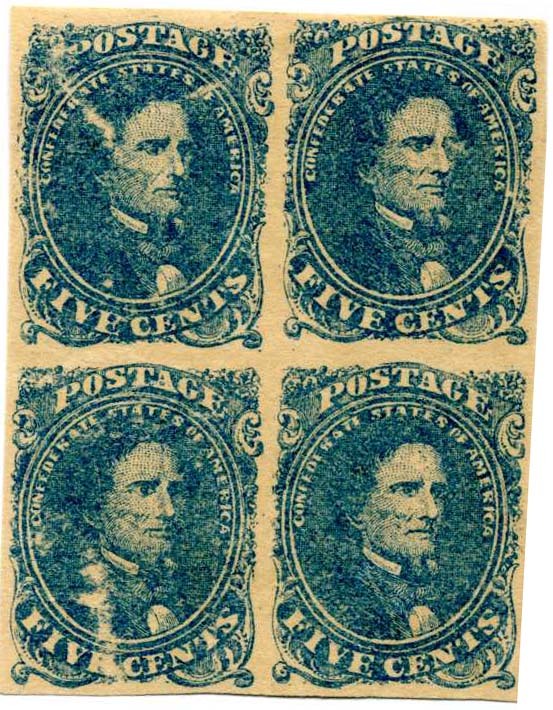 CSA 4, 5¢ blue, unused block of four, Stone 2 positions 23 / 24 / 33 / 34, few tiny thins, original gum. Scarce plated multiple. SCV $1,300. 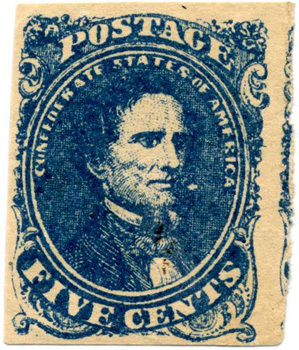 CSA 4 and 6, 5¢ blue lithograph and 5¢ blue typograph mixed franking used on small piece with Richmond, Va. cancels, #4 plated by Knapp as Pos. 26, Stone 3, pre-use sealed tear in #4, Scarce Use. #4 alone catalogs $250. CSA 4, 5¢ blue, Stone 2 gutter block of six, unused, no gum,with multiple faults as usual for such larger blocks. A scarce position piece easily plated from the top left down as positions 41 and 42, 1 and 2, 11 and 12. 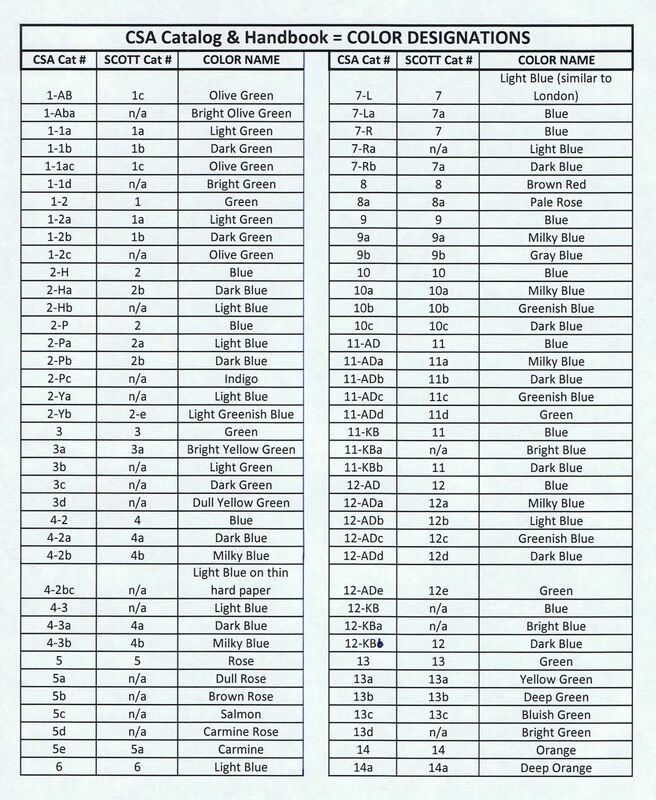 You would think from a quick glance that the widely spaced bottom two pairs would produce the gutter, but in fact positions 1 and 2 are in the center which means the actual position break is above them. There are some very nice varieties here as both positions 1 and 2 both show clipped transfers at the lower left and position 12 shows the constant easily recognized over-inked upper right corner variety. Scott Catalog Value as simple block and pair is $1,925++. A wonderful chance to study plating and positions. 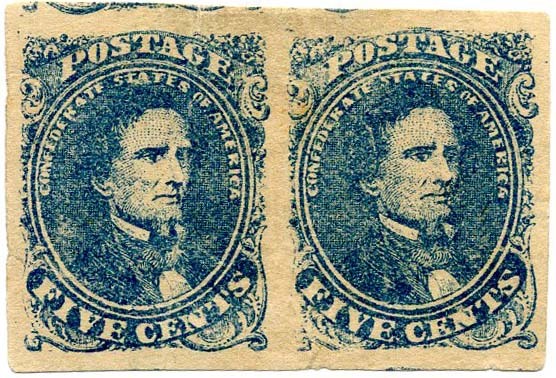 CSA 4, 5¢ blue pair used with blue HILLSBORO / N.C. / JUL / 19 double circle cancel, tiny pinhole and tiny thin, SCV $470. CSA 4, 5¢ blue, unused, no gum, small faults; Not plated: Stone 2 SCV $130., Stone 3 SCV $500. You do the time consuming plating, you reap the rewards. $100. CSA 4a, 5¢ dark blue, tied on small piece with blue COLUMBIA / S.C. cds.Not plated: Stone 2 SCV $195, Stone 3 SCV $290 (likely Stone 3). You do the time consuming plating, you reap the rewards. $250. 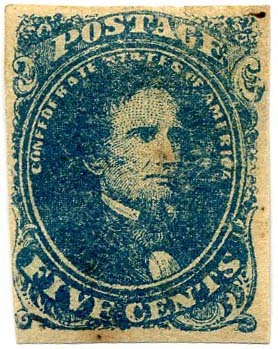 CSA 4, 5¢ blue, 4 margin copy used with ---NVILLE / VA / MAY / 6 cds, thinned, hinge remnant, Very Fine appearance. $70. 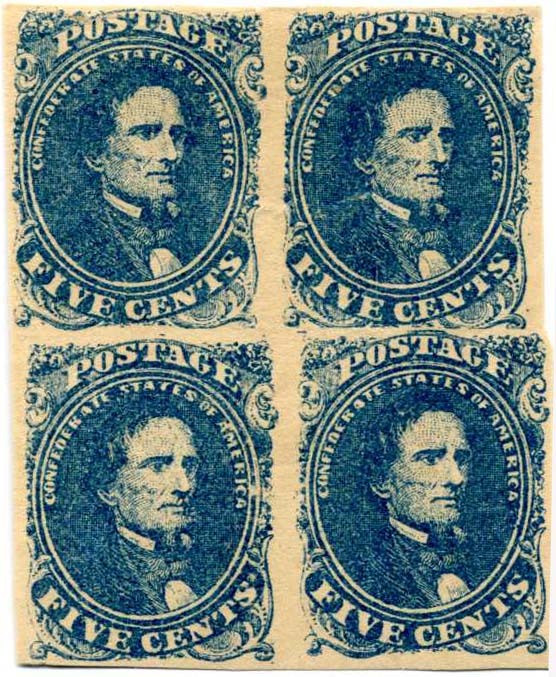 CSA 4a, 5¢ dark blue block of four with lower left stamp the GOOSENECK VARIETY, position 25, which makes this positions 15/16/25/26, full original gum, very lightly hinged, gum stained, 2012 SCV $1,300. This variety not cataloged by Scott, but is a constant variety listed in 1929 Dietz and will be a listed variety in the forthcoming CSA Catalog. $450. 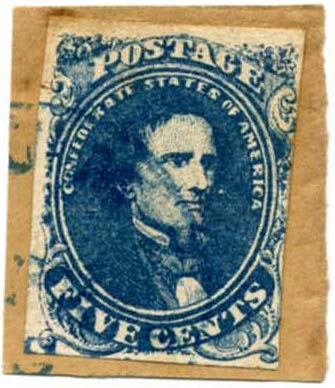 CSA 4 variety, 5¢ blue, Stone 2 - line through E of POSTAGE, copy of 2002 PSE certificate as “OG, NH, natural gum wrinkles and tiny thin at top, Grade GD 30” $450. 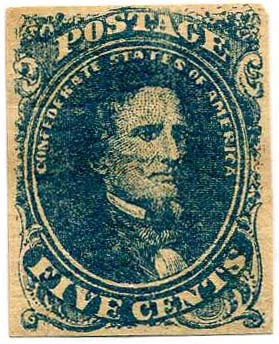 CSA 4a, 5¢ dark blue, Stone 3, Position 36 from Lower Left Pane, original gum, small crease and tiny thin, fresh and lovely looking copy with huge margin at right encompassing adjacent stamp, 2012 SCV $800. $600. 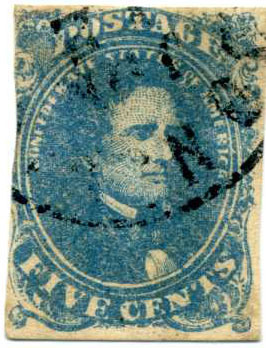 CSA 4, 5¢ blue, original gum, never hinged, natural gum wrinkles (one heavy). $200. 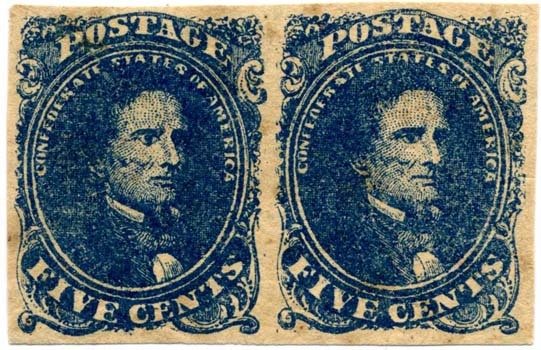 CSA 4a, 5¢ dark blue vertical pair, Stone 2, Positions 7 / 17 with full original gum (expected stains, although light), never hinged, heavy vertical crease almost breaking to a tear along the left side, 2012 SCV $625 as regular shade. $300. 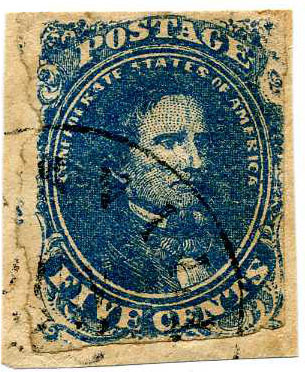 CSA 4a, 5¢ dark blue, Stone 2, Position 8 with full original gum, usual gum stains, although light, never hinged, Very Fine, SCV $250. $240. 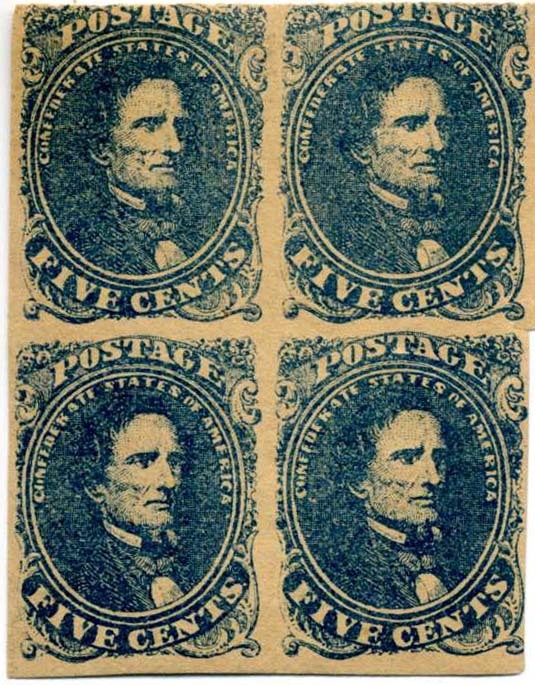 CSA 4, 5¢ blue Stone 2 top left corner margin block of 4, manuscript canceled, post office crease vertically between stamps otherwise Very Fine, SCV $2,000 for hand canceled. $900. 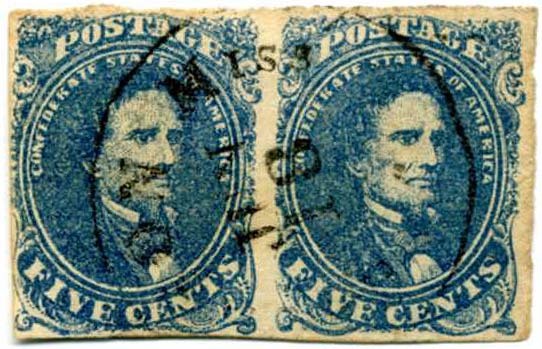 CSA 4-2a, 5¢ dark blue pair, Stone 2, positions 27-28, original gum, diagonal crease across pair, tiny edge thin on right stamp, SCV $625. $350. 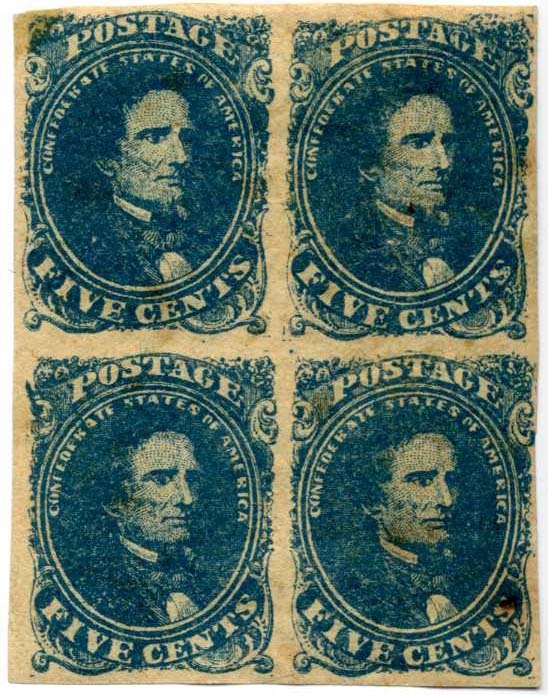 CSA 4, 5¢ dark blue block of four, unused (no gum), faulty, 2019 SCV $1,300. $250. 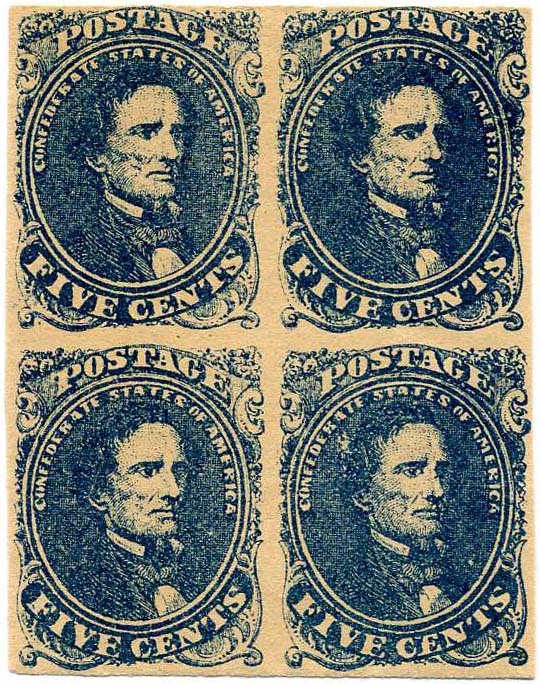 CSA 4a, 5¢ dark blue bottom sheet margin block of four, unused, full original gum, light gum creases and stains, SCV $1,300.+ $650. 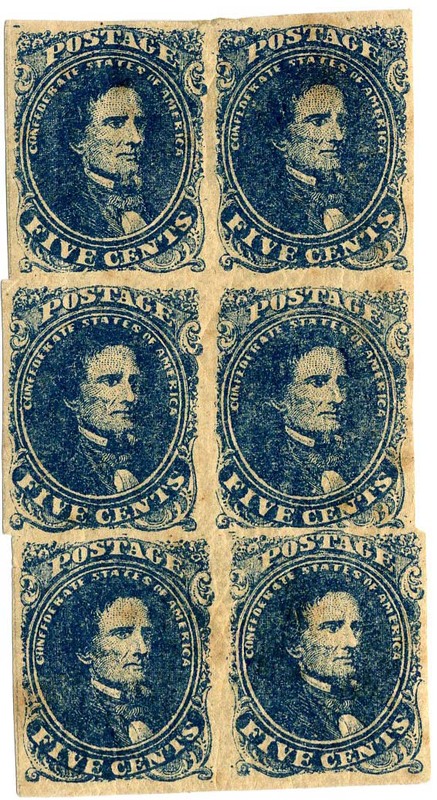 CSA 4a variety, 5¢ dark blue block of four, positions 11-12 / 21-22, listed SPUR VARIETY on upper left scroll of position 21, full original gum, faint gum creases and stains, SCV $1,325.+ $600. 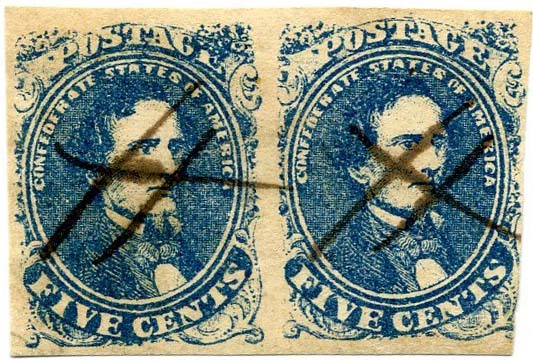 CSA 4, 5¢ blue, unused pair, part original gum, thins and creases, bit of gum staining, SCV $625. $250. 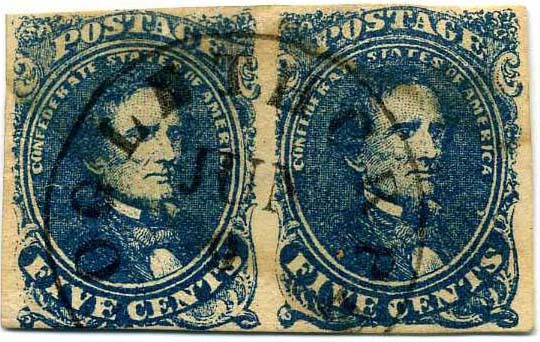 CSA 4, 5¢ blue left sheet margin pair used with clear bold GREENVILLE / TEN // AUG / 16 cds, thins on right stamp only, very showy and handsome pair, SCV $450. $350. 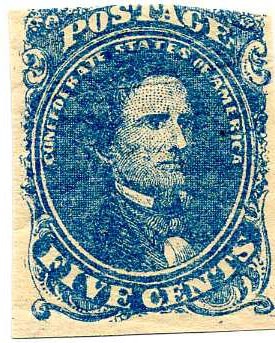 CSA 4, 5¢ blue, unused, fresh, no gum, Very Fine, 2019 SCV $225. $125. 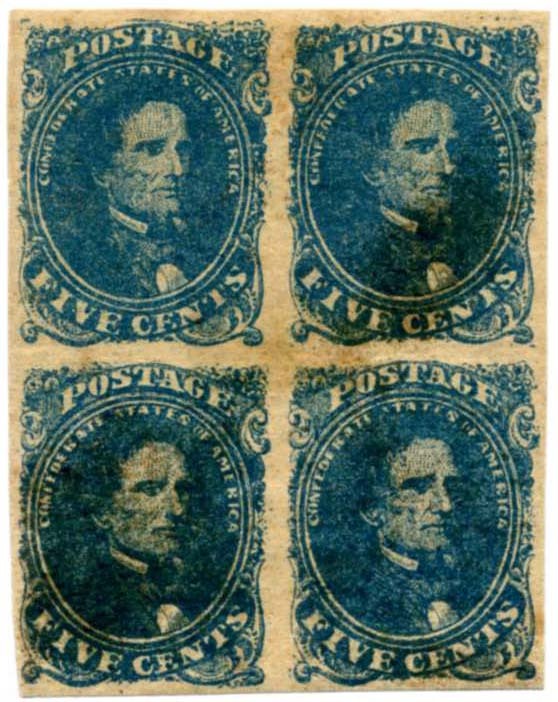 CSA 4, 5¢ blue block of 4 with narrow gutter between right vertical pair, original disturbed gum, four margins, tiny thins in top two stamps, otherwise Very Fine, Scarce position piece, SCV $1,300+ $1,000. 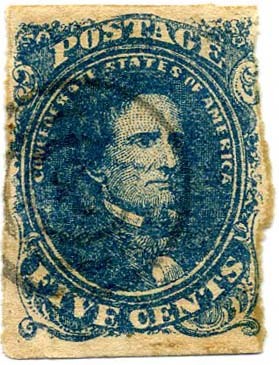 CSA 4, 5¢ blue, Stone 3, position 31, unused, full original gum, small faults, SCV $750. $350. 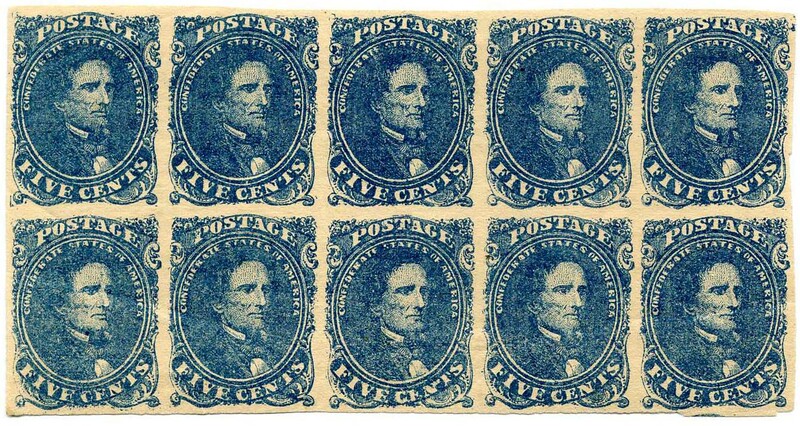 CSA 4, 5¢ blue, Stone 3, position 41, unused,full original gum, lower left corner hinged back on, SCV $750. $250. 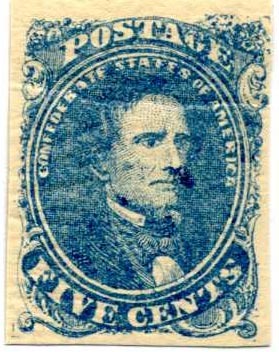 CSA 4, 5¢ blue, Stone 3 block of 4, positions 32, 33 / 42, 43, original gum, thin on position. 33, gum bubbles, plated by eminent lithograph student Leonard H. Hartmann, $4,500. Quite Scarce. $4,000. 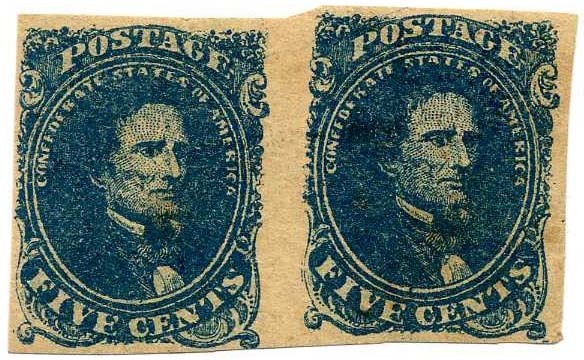 CSA 4, 5¢ blue pair, 50% original gum, thin on left stamp only, SCV $625. $350. 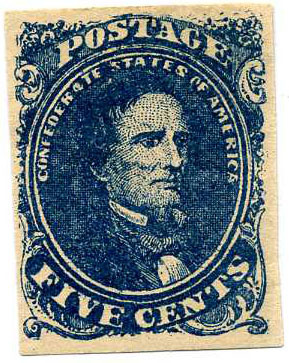 CSA 4a, 5¢ dark blue, over inked with gum soaks and tiny purple stain at upper right edge, original gum, SCV $260. $150. 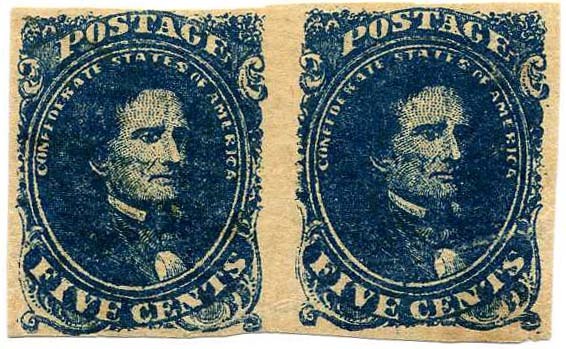 CSA 4, two 5¢ blue singles of different shades (one a bottom sheet margin copy, both with large margins) in tête-bêche arrangement on small piece of folded letter tied together by MEMPHIS / TEN. // MAY / 3 / 1862 cds, Exceptionally nice “pair”. $400. 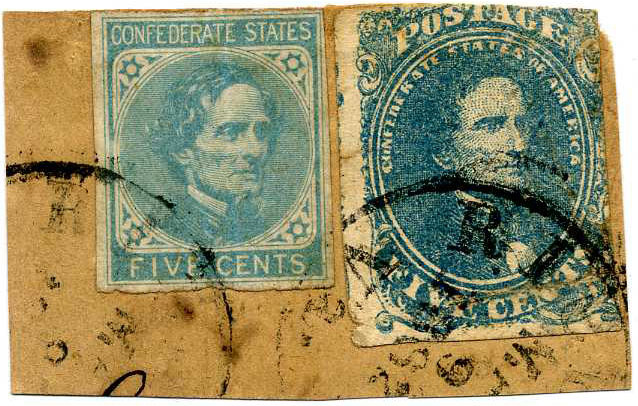 CSA 4, 5¢ blue, original gum, heavily hinged, hinge think at top, small tear at left, Very Fine appearance, SCV $225. $120. 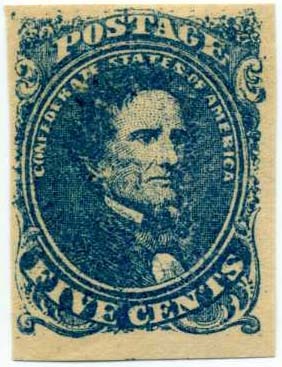 CSA Catalog 4-2, 5¢ blue, Stone 2, position 45, usual browned original gum, Very Fine. $250. 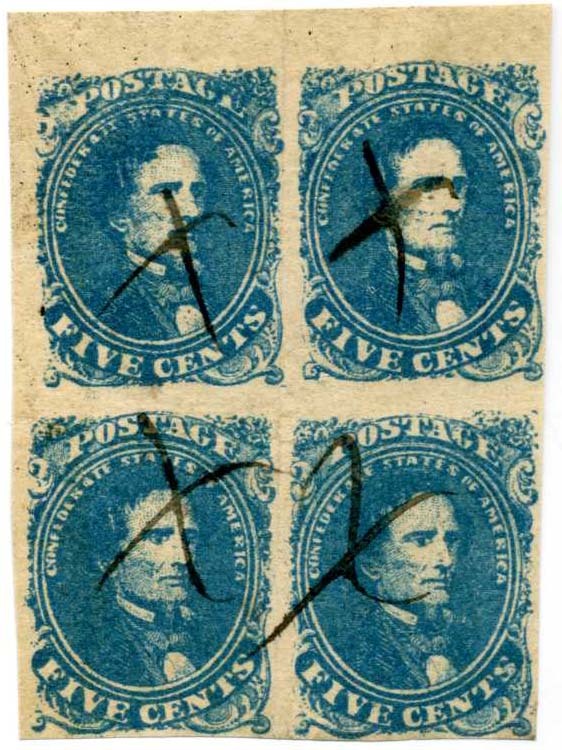 CSA 4-2-v1, 5¢ blue with SPUR VARIETY at upper left, position 21, unused,internal sealed tear, no gum, CCV $235. $90. 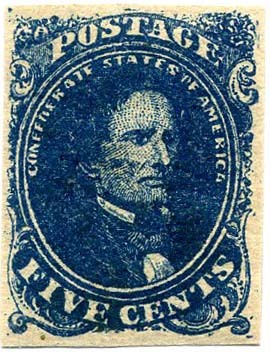 CSA 4a, 5¢ dark blue, full original gum with small faint crease at upper left. SCV $275. $150. 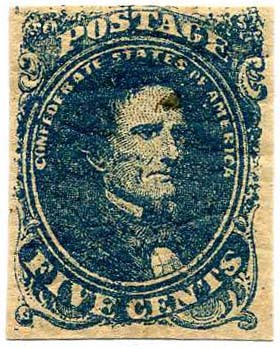 CSA 4, 5¢ blue, full original thick brownish gum with usual gum wrinkles, small stain on head, SCV $225. $180. 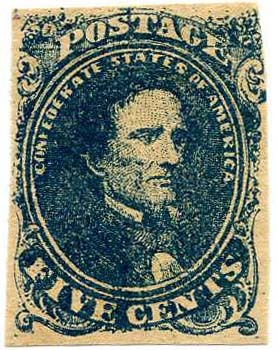 CSA 4, 5¢ blue, 4 ample to huge margins,full original thick brownish gum with usual gum wrinkles, tiniest pinhole otherwise Very Fine, SCV $225. $230. 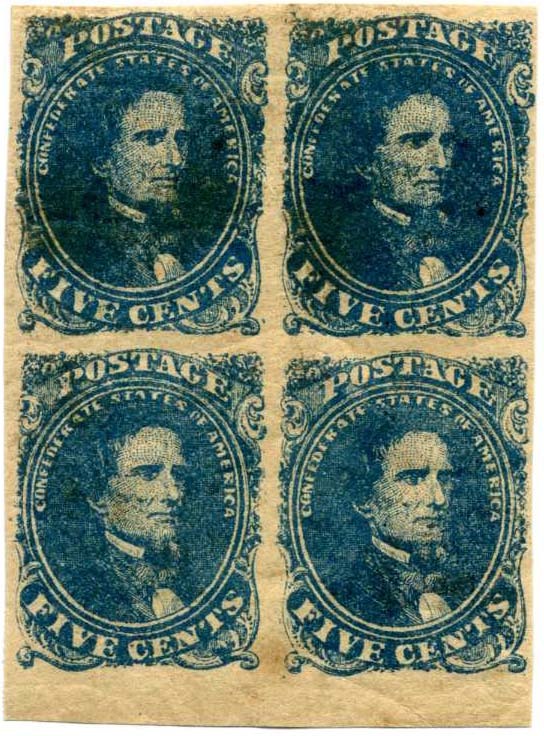 CSA 4, 5¢ blue, 4 large margins, large part original gum, couple tiny thins, Extremely Fine appearance SCV $225. $150. 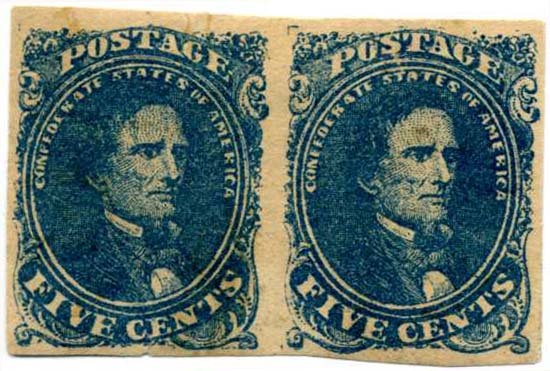 CSA 4-2, 5¢ blue, CROSS GUTTER PAIR, positions 50-51, full original gum, entry with right stamp nicely displaced from the left, margins all around, faint thin, a wonderful scarce pair. SCV $1,250. $600. 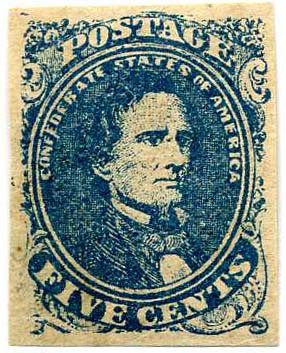 CSA Catalog 4-2d, 5¢ blue, Stone 2 with NARROW VERTICAL GUTTER, original gum, deep rich color, diagonal corner creases, Scarce pair. CCV $1,000. $550. 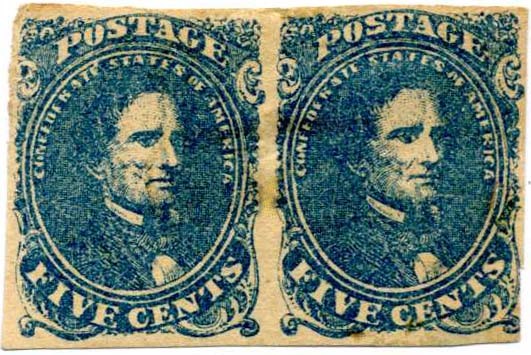 CSA 4, 5¢ blue VERTICAL PAIR, fresh, original gum a bit glazed, Very Fine. SCV $625. $400. 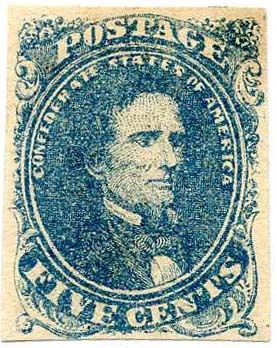 CSA 4, 5¢ blue VERTICAL PAIR, fresh, original gum, crease and thin in bottom stamp, 4 margins, Very Fine appearance. SCV $625. $250. 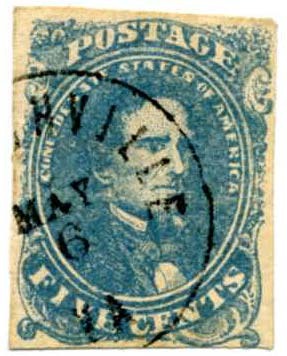 CSA 4, 5¢ blue Stone 2 LEFT SHEET MARGIN STRIP OF 3, fresh, full original gum, TRANSIENT WHITE SPOT in hair of center stamp (CSA Catalog variety 4-2-v9), small faults, CCV $750. for all, CCV for center stamp alone $300. $400. 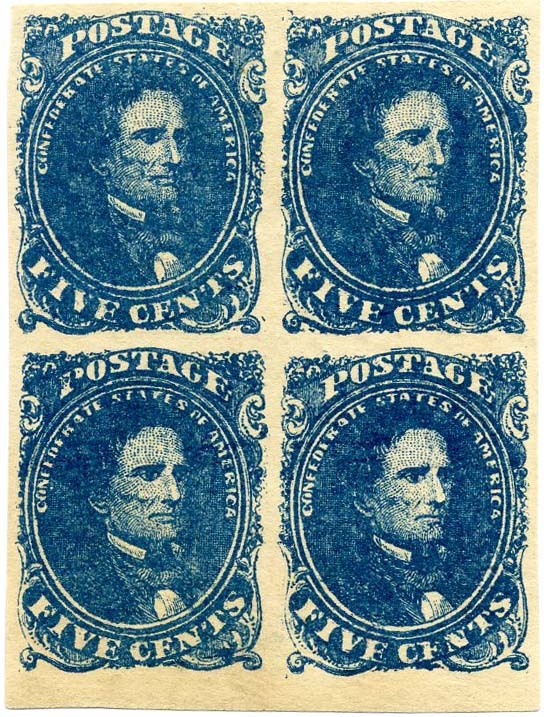 CSA 4-3, 5¢ dark blue (SC 4a), BLOCK of 4 STONE 3, positions 42-43 / 52-53, plated by Hartmann, original gum, lightly hinged, full margins, bright color, Choice! SCV $4,500. CCV $9,000. $3,500. 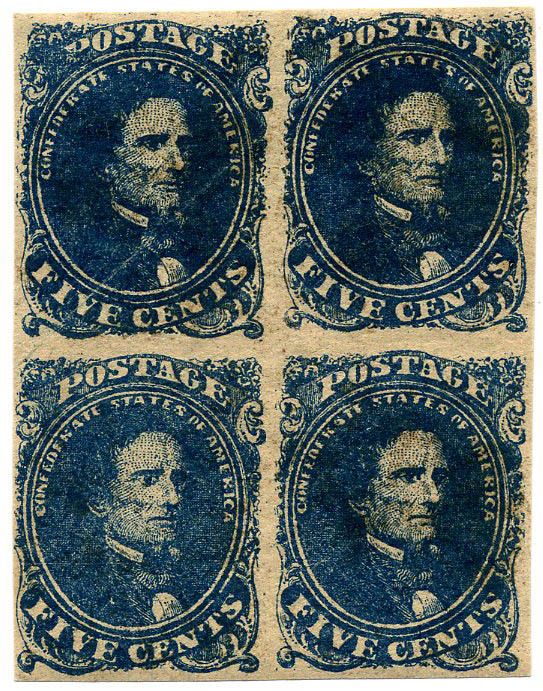 CSA 4-3, 5¢ dark blue (SC 4a), BLOCK of 4 STONE 3, large part disturbed original gum, hinge remnant, sheet margin at left, deep rich color, faults include several small thins, crease and edge tear, Very Fine appearance, Scarce block! Choice! SCV $4,500. CCV $9,000. $1,300. 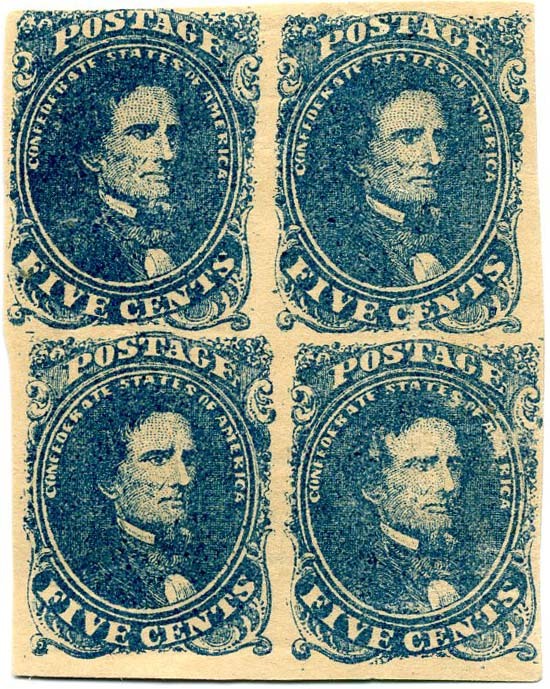 CSA 4-3, 5¢ dark blue (SC 4a), Stone 3, positions 27-28 / 37-38 / 47-48, BLOCK OF SIX in 2 x 3 format, deep rich color, very clear "scratches"transient varieties in positions 37, 47 and 48, full margins to barely touched at upper right, light crease between the two vertical rows, plating by Hartmann with his initials on verso, Very Fine appearance. A SCARCE UNUSED MULTIPLE FROM STONE 3. SCV as block of four and pair $5,350. CCV for block alone is $9,000. $2,000. 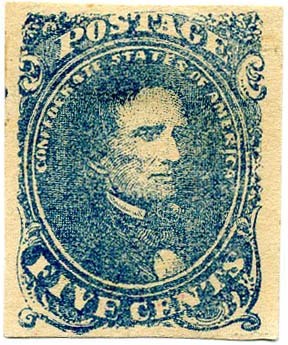 CSA 4-2-v7, 5¢ blue BLOCK OF 10, positions 35-40 / 45-50 with upper right stamp the “flower” or “blob” (I prefer flower!) 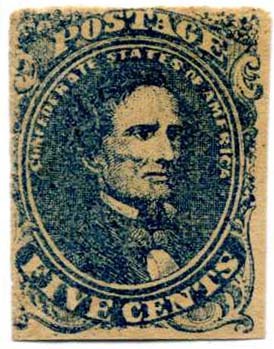 variety in position 40, full original gum with usual creasing and small thins, CCV as 2 blocks, the variety and a single $2,650. Scarce block. $1,500. 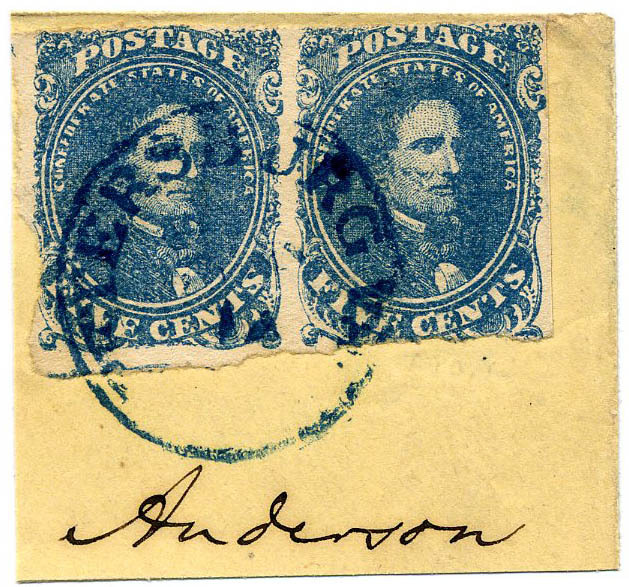 CSA 4a, 5¢ dark blue pair, Stone 2, Position 46-47 (plated on pencil in verso by prior owner), used with bold OGLETHORPE / Ga. // JUN / 9 cds, wavy cancel at top caused by contents of envelope to which affixed, still remarkably half original gum, tiny filled pinhole, 2013 CSA Certificate 05797, 2013 SCV $450.+ $220. 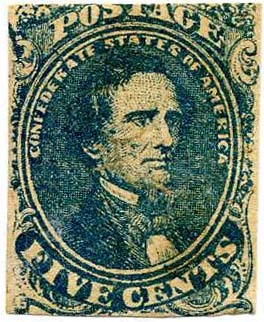 CSA 4, 5¢ blue, unused (no gum), fresh, thin otherwise Very Fine appearance, 2019 SCV $225. $110. 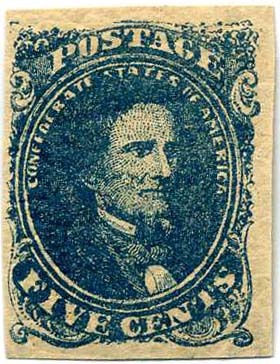 CSA 4-3, 5¢ light blue, purported Stone 3 but not verified by me (you plate it and reap the reward), used with RICHMOND cds, Ex Wishnietsky. $150. 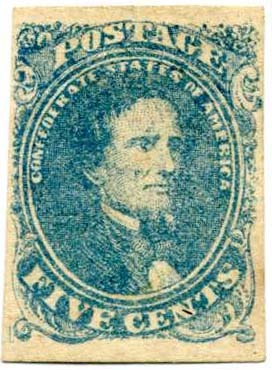 CSA 4, 5¢ blue, full original gum, small stain at bottom, Very Fine. $150. 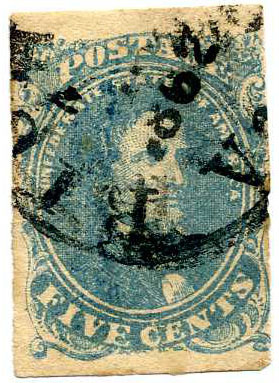 CSA 4-2, 5¢ dark blue, Stone 2, positions 27-30 / 37-40, horizontal block of 8, large part disturbed original gum, faults include small repair to Pos. 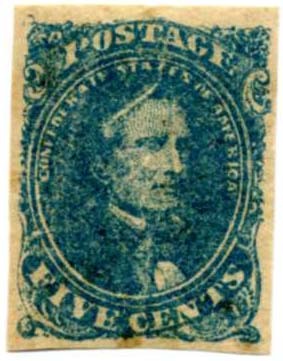 28, horizontal crease between rows, otherwise Fine, SCV as two blocks of 4 $2,600. $950. 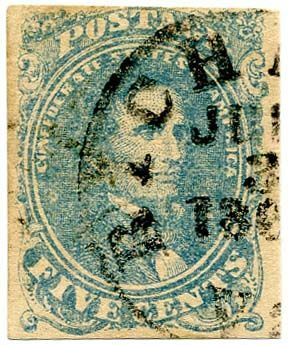 CSA 4-2a, 5¢ dark blue, Stone 2, vertical block of 6 crossing two transfers of the stone and showing NARROW HORIZONTAL GUTTER plus MISALIGNMENT of top and bottom transfers, brown original gum thickly applied which causes some wrinkling, couple tiny thin spots, SCV as regular block and pair $1,925. $950. CSA 4-2a, 5¢ dark blue, Stone 2 block of 4, full original gum, small thins and usual gum creasing. SCV $1,300. $500. 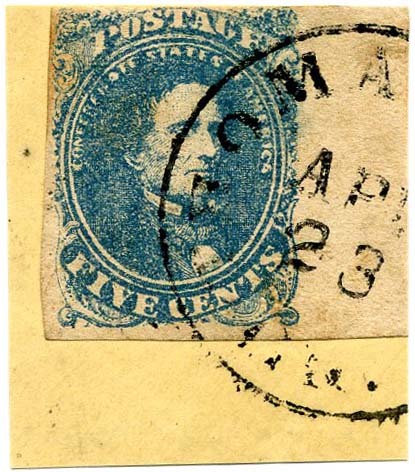 CSA 4, 5¢ blue, block of 4, full original gum, positions noted on verso 3-4 / 13-14, heavy hinge remnant on top pair, SCV $1,300. $450. 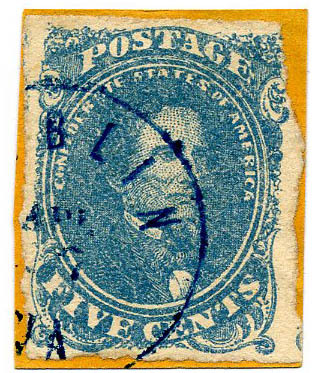 CSA 4, 5¢ blue, 60% original gum with gum staining, heavy hinge remnant, thin, SCV $225. $95. 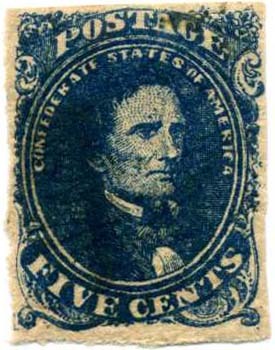 CSA 4, 5¢ blue with part original gum, 2 hinge remnants, fresh, Very Fine. $250. 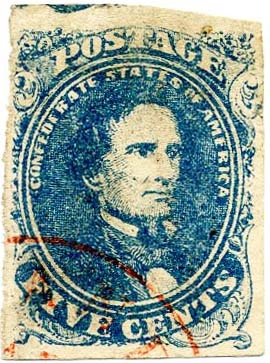 CSA 4, 5¢ blue right sheet margin single tied on small piece by bold THOMA[SVILLE] Ga. // APR / 23 cds, slight gum stain at upper right otherwise wonderful huge margin copy, Ex Cox. $250. 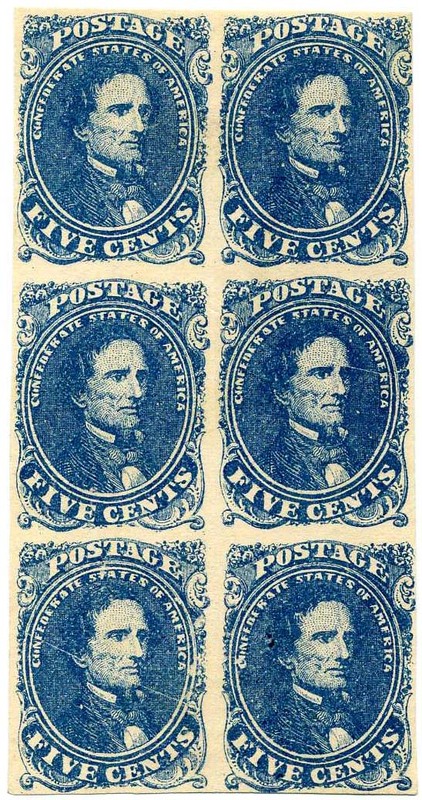 CSA 4, 5¢ blue, fresh, unused, regummed, horizontal crease, Very Fine appearance, 2019 SCV $225 as unused. $100. 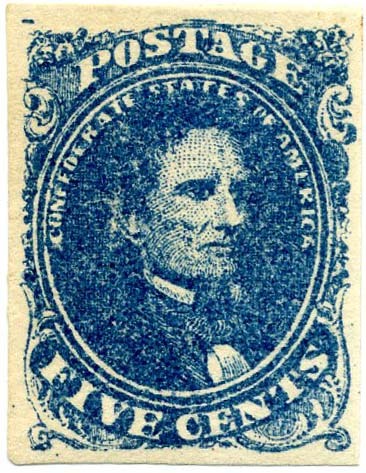 CSA 4, 5¢ blue, unused (no gum), Very Fine, 2019 SCV $225. $140. 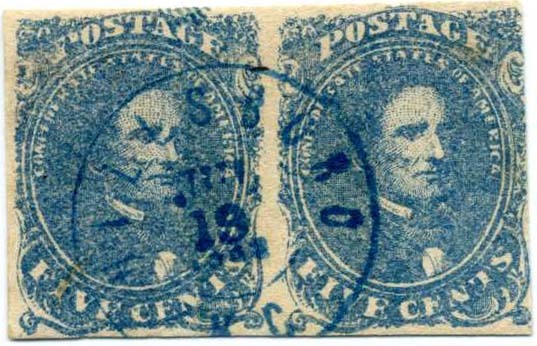 CSA 4-2, 5¢ blue pair, Stone 2, used with manuscript cancels. $200. 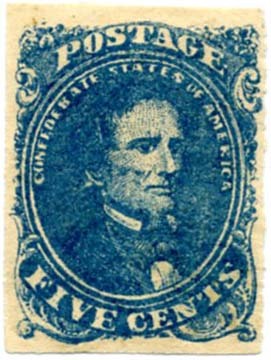 CSA 4, 5¢ blue with margins all around and showing part of adjacent stamp at top, FACE FREE red town postmark, tiniest edge tear at right otherwise Very Fine, SCV $350. $280. 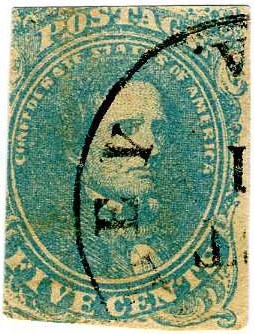 CSA 4, 5¢ blue used with concentric circles cancel, slight gum soaked edges, faint bend at lower left which shows only when dipped, SCV $125. $60. 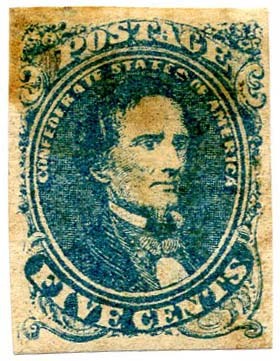 CSA 4, 5¢ blue, large margins all around, original gum, light hinge remnant, light owner backstamp and writing, Very Fine. $200. 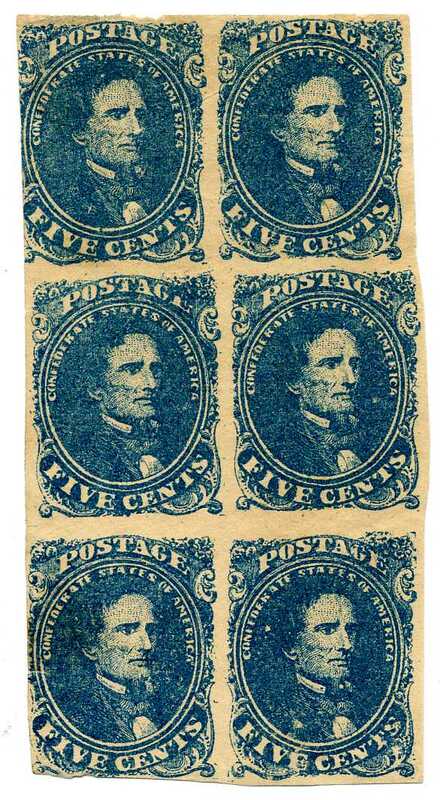 CSA 4-2a, 5¢ dark blue, Stone 2, Transfer Stone positions 47-48/57-58 bottom sheet margin block of 4, pristine, original gum, very lightly hinged, pristine, NICE! SCV $1,300. $950. 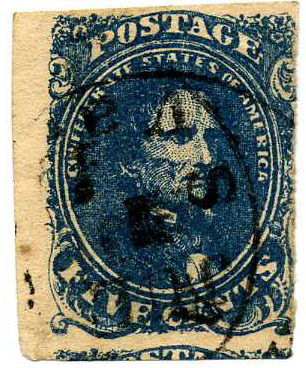 CSA 4, 5¢ blue upper right corner single, unused (no gum) with pressed out creases and small hinge thin but Superb appearance. 2019 SCV $225. $75. 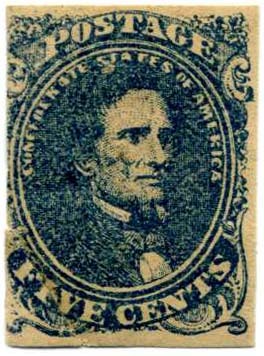 CSA Catalog 4-2 (Scott 4a), 5¢ dark blue, position 22, full glazed original gum, light hinge remnant, fresh, Very Fine, SCV $275. $300. 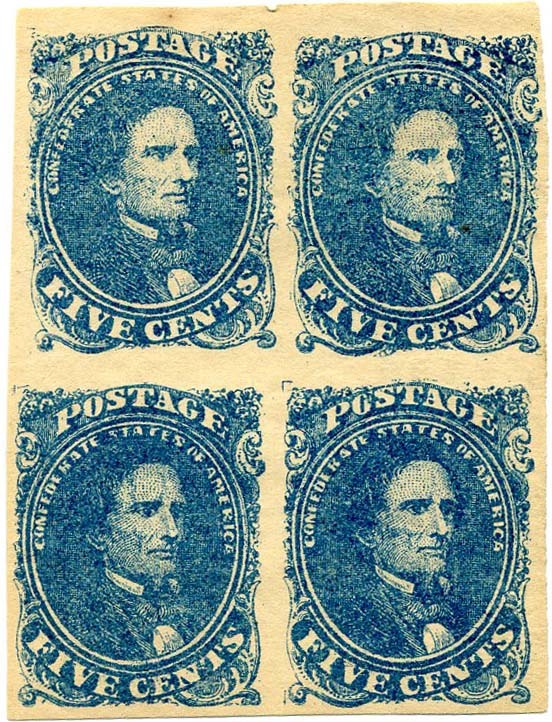 CSA 4a, 5¢ dark blue, 4 large margins, regummed, fresh, Extremely Fine, 2019 SCV $275. $250.